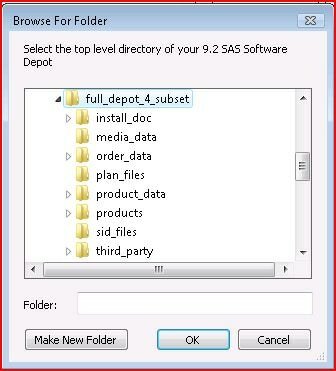 The SAS 9.2 Depot Subsetting Utility enables you to create a subsetted depot of selected SAS® 9.2 Foundation products and SAS® 9.2 clients from your SAS® 9.2 master depot. The subsetted depot is projected to be smaller in size than your master depot because it has fewer SAS products in the products directory of the subsetted depot. Important: The SAS® 9.2 Depot Subsetting Utility should only be used with SAS® 9.2 depots. 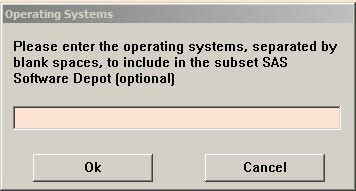 Do not use this utility with SAS® 9.3 depots. The following table provides a list of the most commonly installed clients and required components, their corresponding software codes, and the approximate amount of depot space that is required for each product. To project the size of the SAS Foundation products in a subsetted depot, see the "Space Requirements" sections in System Requirements for SAS 9.2® Foundation for Microsoft Windows and System Requirements for SAS® 9.2 Foundation for Microsoft Windows for x64. 1. Creating the master SAS Software Depot. 2. Creating the directory location for the subsetted depot on the target machine. 3. Ensuring that you have appropriate privileges in the master SAS Software Depot and in the directory location for the subsetted depot on target machine. 4. Downloading the Depot Subsetting Utility. 5. Configure the SASDepotSubset-All.txt, SASDepotSubset-Foundation.txt, and SASDepotSubset-Clients.txt file. 7. Running the Depot Subsetting Utility. 8. Inspecting SASDepotSubset.log for error messages. 9. Determining what to do with the subsetted depot. Create the master SAS Software Depot. From media or by download, create a SAS Software Depot that will be the master depot to be used as the source from which to create the subsetted depot. 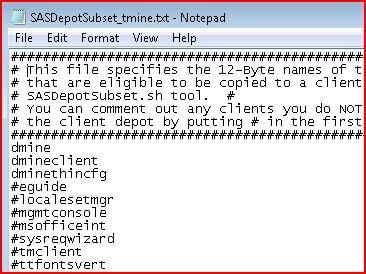 Create the directory location for the subsetted depot on the target machine. 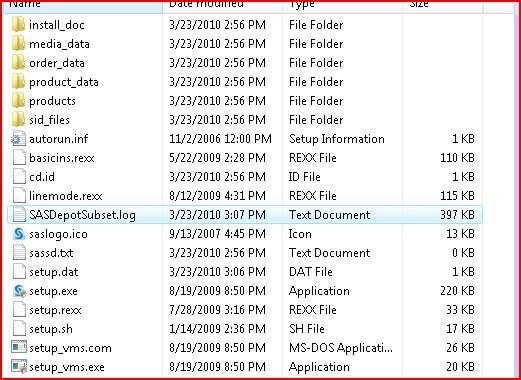 Using Windows Explorer, you can create the directory where the subsetted products will be placed or you can create that directory by clicking Create New Folder using the Depot Subsetting Tool. Ensure that you have appropriate privileges. Read access to the master SAS Software Depot. Write access to the directory where the subsetted depot will be created. 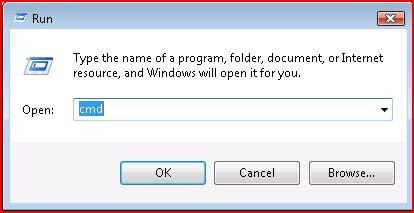 Delete access to the directory where the subsetted depot will be created. Download the Depot Subsetting Utility. Select the Download tab, and download the Depot Subsetting Utility (DepotSubsetUtility.zip). Unzip the .zip file, and for the Windows version of the Depot Subsetting Utility, extract SASDepotSubset.exe and SASDepotSubset.txt. You can extract the utility to any location. It can reside locally or remotely from the master or target depot locations. You must correctly configure whichever .txt file you need to ensure that you place the correct SAS products in your subsetted depot. You can point to any one of these three .txt files when you start creating the subsetted depot. Select wanted products by removing the pound sign (#) in front of that product that comments out that selection. In the screenshot below, non-SAS Enterprise Miner products have # signs in front of them and thus will not be placed in the subsetted depot. 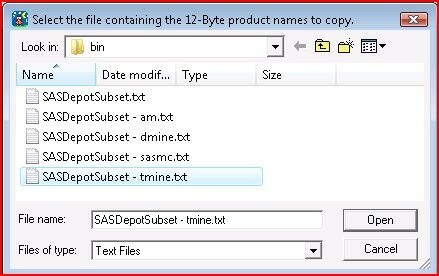 Note: To include the SAS Text Miner Client in the subsetted depot, in the SASDepotSubset.txt file you must include both software codes tmclient and tmine. Not all SAS Foundation products and SAS clients need to be copied to the subsetted depot and are optional. However, they will be copied if they exist in the master depot and you have specified them in the .txt file that you choose during the subsetting process. 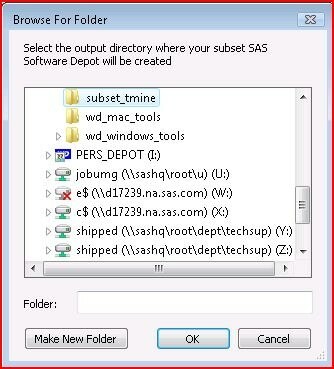 You can include any combination of SAS Foundation products or SAS clients in the subsetted depot. # Foundation depot if the products exist in the order being subset. # client depot if the products exist in the order being subset. Select an operating system from your order. Run the Depot Subsetting Utility. 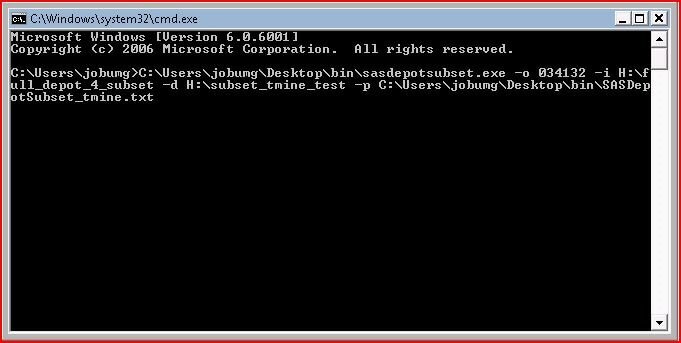 running the SASDepotSubset via a DOS command prompt using parameters. Select the source master depot directory. Select the target subset depot directory. 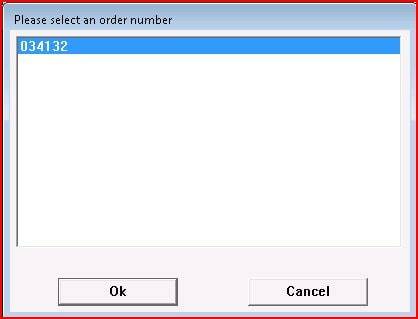 Select the appropriate order number (you might have more than one). Select the SASDepotSubset file that contains the product list of clients. 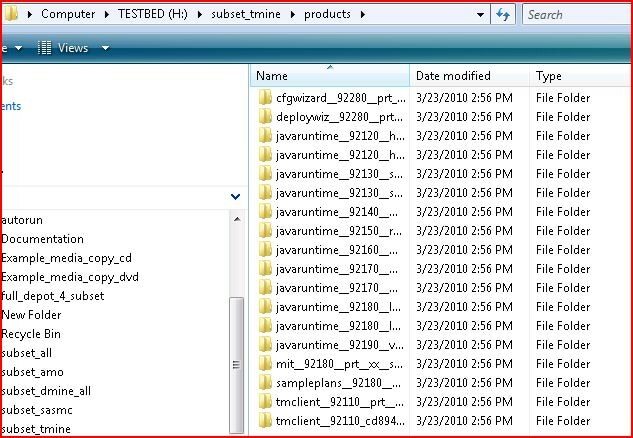 The utility starts copying from the source master depot directory to the target subset depot directory. -s (operating systems which are to be included in the output SAS Software Depot. Select Start ► Run, type cmd, and select OK. Enter the code (as shown in the above syntax sample). Click Enter and the code runs. No dialog boxes appear when you run the SASDepotSubset.exe via a DOS prompt unless the syntax is faulty, a parameter is missing and the subsetting utility prompts you for the missing parameter, or a non-syntax error occurs. After successfully creating the subsetted depot, the log opens for your inspection. Determine what to do with the subsetted depot. With the subsetted depot, you can now burn media, copy the depot to other locations, or install the SAS Foundation products and SAS clients. You can only place SAS Foundation products and SAS clients from one order in a subsetted depot; the utility does not currently support SAS Foundation products and SAS clients from multiple orders in the same depot. Once you have created a subsetted SAS Software Depot, you will not be permitted to place another set of SAS Foundation products and SAS clients in the depot or download any order (including maintenance) to the subsetted SAS Software Depot. If you want to create a subsetted depot of maintenance for SAS Foundation products and SAS clients, you will need to create a master depot of a maintenance order and then run the subsetting utility against the newly created master depot. The result will be a separate subsetted SAS Software Depot with the selected SAS Foundation product and SAS client product set with maintenance. You cannot use the depot subsetting utility to subset any languages. That functionality is projected for a later release of SAS. See SAS note 39212 "Using the SAS® 9.2 Depot Subsetting Utility to create SAS Clients-only depots in the UNIX environment" for creating subsetted depots of clients in a UNIX operating environment. size="1738" time="20100921063531" checksum="665ca19293bbd6ffc75676ee87f58a63. SASDepotSubset cannot proceed. size="1738" time="20100921063531" checksum="665ca19293bbd6ffc75676ee87f58a63 does not exist or cannot be read. The master depot may be corrupt. 478 directories were created or copied. 2561 files were created or copied. 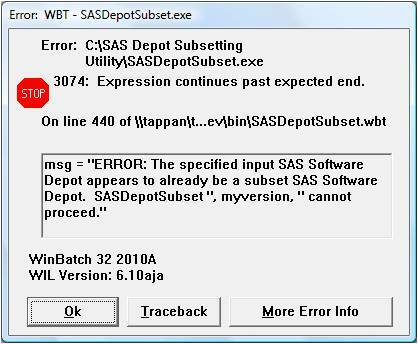 To resolve these errors make sure the newest release of the SAS Depot Subsetting Utility is being used. The current release of the Subsetting Utility is 2.0 which can be verified in the SASDepotSubset.log file at the top as shown below. 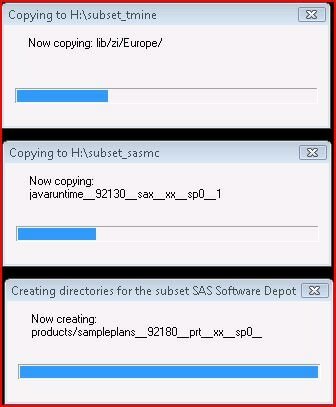 The SAS Depot Subsetting Utility 2.0 is available via the Downloads tab at the top of this page.